This article shows you how to purchase PowerApps for your organization as an administrator. You can purchase PowerApps through the PowerApps website directly, through the Microsoft 365 admin center, or through your Microsoft representative or partner. 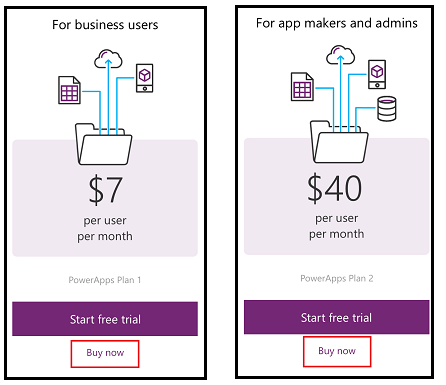 This article will discuss the trial options available for PowerApps Plan 1 or Plan 2 and then explain how to purchase PowerApps Plan 1 or Plan 2 as an organization. For more information, see PowerApps in your organization Q&A. To purchase PowerApps for an organization, you must already be an Office 365 Global or Billing Admin of a tenant, or you must create a tenant. For details about what licenses you can choose for your organization, see PowerApps licensing overview. You can purchase PowerApps subscriptions for your organization from powerapps.microsoft.com and then assign PowerApps licenses to your users. Learn more. 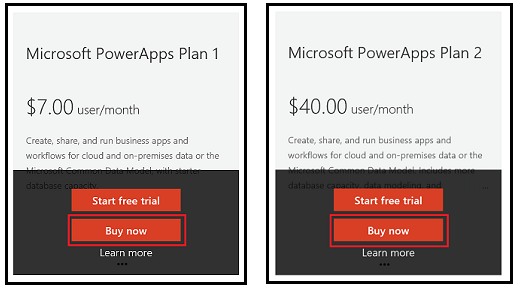 Open powerapps.microsoft.com, and then select Pricing. Select Buy now for the plan you want. Provide information to make the purchase, and then navigate to the Microsoft 365 admin center to assign PowerApps licenses to your users. You can purchase PowerApps subscriptions for your organization from the Microsoft 365 admin center and then assign PowerApps licenses to your users. Learn more. PowerApps will be added to existing and new Office 365 subscriptions in November 2016. If you sign in to PowerApps with an Office 365 subscription prior to this change going out, you will be prompted to sign up for a free PowerApps Plan 2 trial. Feel free to sign up for the trial if you want to try out PowerApps until the update is made to your Office 365 subscription. However, please be aware that the trial license may include features of PowerApps that are not available to you through your Office 365 subscription when the trial expires after 30 days. 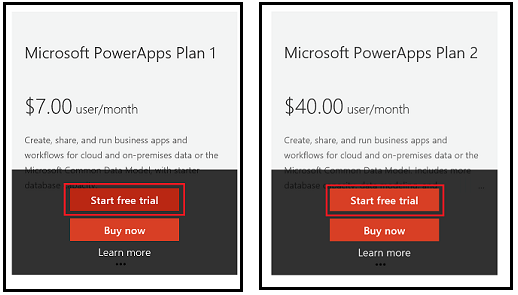 See PowerApps pricing to see what capabilities are included in your Office 365 subscription. On the left navigation pane, select Billing -> Subscriptions. Select + Add subscriptions on the right side. Under Other Plans, hover over the ellipse (...) for the plan you want, and then select Start free trial. On the confirmation screen, select Try now. Under Billing -> Subscriptions, you will see Microsoft PowerApps Plan 1 Trial or Microsoft PowerApps Plan 2 Trial listed with 100 licenses available. Your free trial will cover 90 days. Under Other Plans, hover over the ellipse (...) for the plan you want, and then select Buy now. Enter the number of licenses you would like to add, and then select Check out now or Add to cart. You can add more licenses later if needed. Under Billing -> Subscriptions, you will see Microsoft PowerApps Plan 1 or Microsoft PowerApps Plan 2 listed. If you decide later that you want to add more licenses, go back to Add subscriptions and then select Change license quantity. These are not supported yet.